2008. Deepspace is a pseudonym for Mirko Ruckels, a German-born ambient/electronic musician who now resides in Brisbane, Australia. His previous releases have been self-released, and The Glittering Domain is his debut on Hypnos Secret Sounds. "Mirko Ruckels is a great new talent, a cross between Steve Roach and Stars of the Lid, with a dash of Budd and Eno." Abstract and definitely "ambient" in nature, The Glittering Domain simultaneously exhibits a strong musical sensibility, with a sound and structure reminiscent of artists such as Vidna Obmana and Numina. Though Hypnos may be best known for unstructured "drone" style recordings, we really enjoy a recording like this one that has more of a tonal basis. "Lush, exquisite, flawless, refined, striking, beautiful... we could go on and on with adjectives to describe the music of Deepspace. One of our favorite discoveries in the past year, this is an artist to keep a close eye on - and one we encourage all our listeners to visit right away." "What you are about to hear on this "exclusive(!)" disc is simply amazing!. All eight pieces here are very well structured and has all the elements that a true Ambient/Space CD should have. You will be immersed by mesmerizing sounds that will take you to places you never thought existed, until now. The music itself is very similar to the previous albums by *"Deepspace"* and will continue to evoke very abstract, minimalistic and isolated moments through all the tracks, but there is alo a strong sense of pure space music if you study/listen carefully, sometimes it sounds a bit like *'Between Interval'*. I quote someone else on the following line ---> "It's Lush, exquisite, flawless, refined, striking, & beautiful". I couldn't have said it better myself in the case of this CD. It really is a journey through space & time that has to be experienced. So far, this is definetely the CD of the year/month, and also my all time favourite space music CD in Electronic music. This is a masterpiece, and also a must have disc for fans of *Vidna Obmana, Numina & Robert Rich*. Very well done, Mirko Ruckels!" "Darkened Soul is a project of Mike Soucy, and Bathys is his second solo album of dark ambient music after a release on Umbra, the Italian ambient artist Oöphoi's label. Soucy presents six tracks with Greek titles, all amorphous drones with an emphasis on low frequencies, drenched in reverb. The album title means "deep" in Greek, and it is an appropriate image for the music. Between the low frequencies and the vast distances implied by the echoes, the album conjures up subterranean and sub aquatic images, deep underground caverns of indeterminate proportions. While most of the album contains sounds with a wide harmonic spectrum, almost approaching white noise, Soucy also occasionally and discreetly mixes in sharp and precise sounds. On the title track he adds a metallic arhythmic hammering sound that adds to the infernal atmospheres, and on Ateleiotos Agkareia (Endless Labor) there are sounds like a large metal object dragged across a stone floor. Apart from a couple of insignificant and infrequent loops, melodies are hard to spot on this album, where the primary focus is on changes in texture, with rumbles and sudden sonic blasts providing variation. The individual pieces have their own characteristics, but the listener joins them for a time as works in progress, little snapshots of the eternal sounds.
" 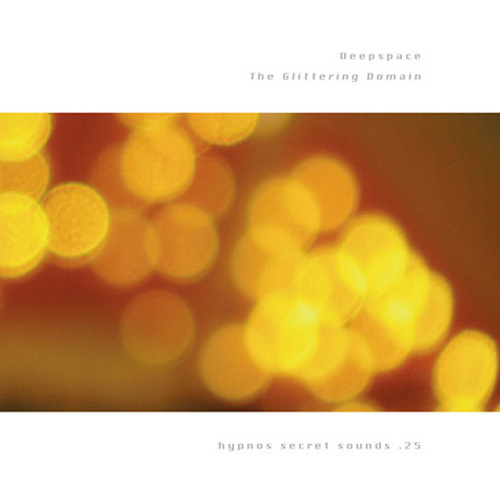 Top 10 Albums of of the year"
"The Glittering Domain" by Deepspace - very satisfying ummm... deep space music - very good to work within." " Top 100 Albums of 2008 (#2)"
"This album is very highly recommended by me for anyone who likes any kind of ambient music. Deepspace displays a slowly spacious, evocative and beautifully poised sound encompassing everything from deep, dreamlike pads to bright bubbling synths- everything is perfectly placed as you'd expect from an artist of this quality. Really excellent stuff."